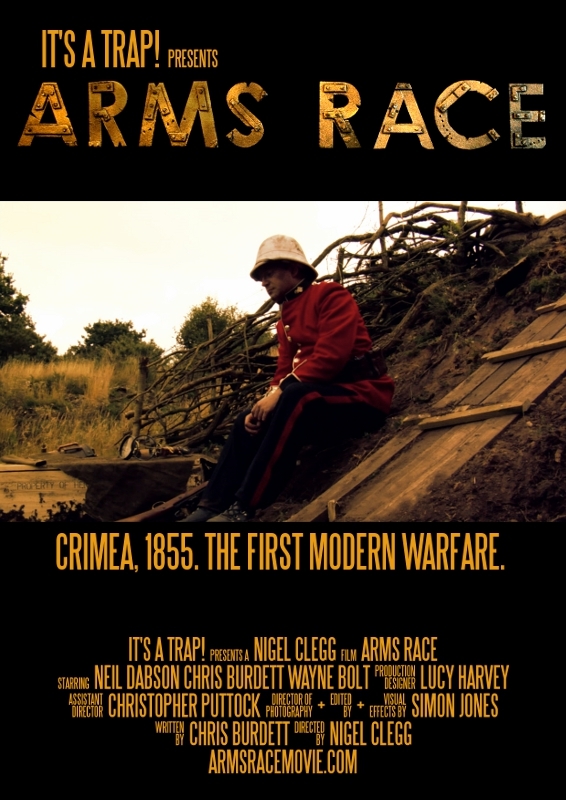 Arms Race was shot in a single day in late summer 2009, which gives you an idea of how long it’s been trundling through post-production. Such is the way of micro-budget, volunteer productions. For such a small production it nevertheless had a well-staffed crew, with dedicated teams taking care of production design, audio and visuals. The day started early for director Nigel Clegg and the art department, all of them arriving at the location: a field in north Norfolk, well away from prying eyes and shot-breaking passers-by with yappy dogs. Their job was transform an innocent slope into a war-torn trench from the Crimean War. The combined efforts of Lucy, Ben, Pete and Gill worked wonders and by the time the rest of the cast and crew arrived a few hours later everything was ready to roll. While make-up and costume were applied to Jon Creek, the original actor to play Private Higson, the first shots were captured with Neil Dabson as Captain Clinton. Perhaps unwisely, these first few shots involved running repeatedly up and down the same stretch of ground, which left both cast and crew slightly breathless. As a tip for fellow filmmakers: don’t start the day with the most physically exerting shots. Moving on to the trench scenes, the production encountered its first calamity: while traversing the uneven terrain, Jon twisted his ankle and found himself unable to continue in the role, despite valiant efforts and determination on his part. While Jon’s ankle was taken care of the production team worked on a solution to the problem: rescheduling wasn’t an option, so a replacement actor was required. All eyes turned to Chris Burdett, writer of the film and somebody who, deep down, everybody suspected would look just right in a period war costume. With costume and make-up hastily transferred the shoot continued, now considerably behind schedule and racing against the sun, which was now at its peak and bearing down on the site. Every passing hour brought us closer to dusk and too little light. Luckily the team pulled together and rattled through the shots at an efficient pace, aided by the slick, essential assistant directing of Christopher Puttock (who had only officially joined the shooting team the night before) and the professional sound recording provided by Bennet Maples and his furry friends (boom mics). The shoot wrapped early evening with all planned and storyboarded shots completed, despite the morning’s setbacks. There was even time for a small, rather exhausted and low-key wrap party once everybody had returned to Norwich and wiped the dirt and dust from their skin. Despite the mammoth efforts from the art department and the sterling work by the cast and crew, for a film of this genre the shoot is only the start of a long, winding road which would see another year pass before the short film reached completion. That, however, is a story for another blog post. 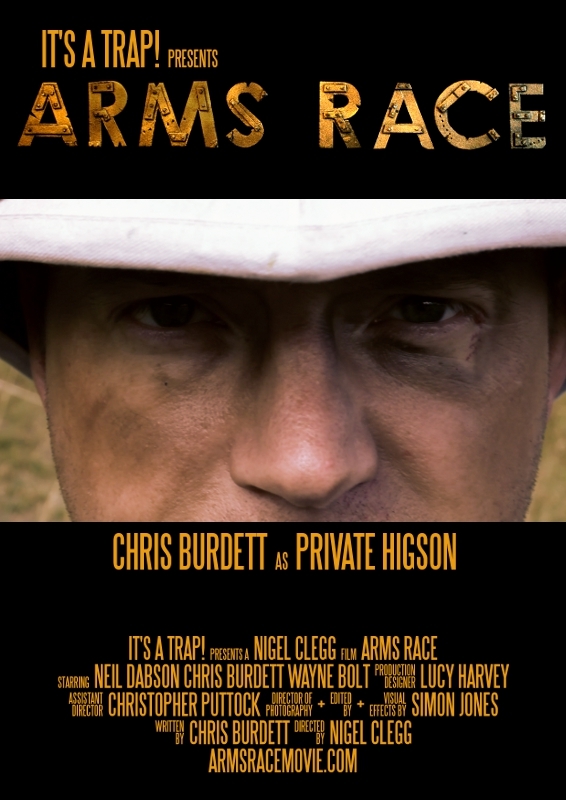 Today’s poster features the character of Private Higson, played by Arms Race writer Chris Burdett. Given that not all of you will be entirely familiar with It’s A Trap! or those involved with the Arms Race short film, we thought it best to do a quick round of introductions to a few of the main players. Please do note that this isn’t an exhaustive list of everybody involved (for that you can pop over to the Cast & Crew list). The It’s A Trap team formed many years ago, initially to organise and run LARP events around the UK (if you don’t know what LARPing is, prepare for an entertaining Google session). Around 2006 the focus shifted towards making short films and, later, audio dramas. In the latter medium It’s A Trap found online success with the Squadron Leader Jack Steel And The Starblade pulp adventure series which spanned the limits of time and space and ran for two series. After producing the monster b-movie NfN (Normal For Norfolk), It’s A Trap member Nigel Clegg decided to step up to director duties for the team’s next project. 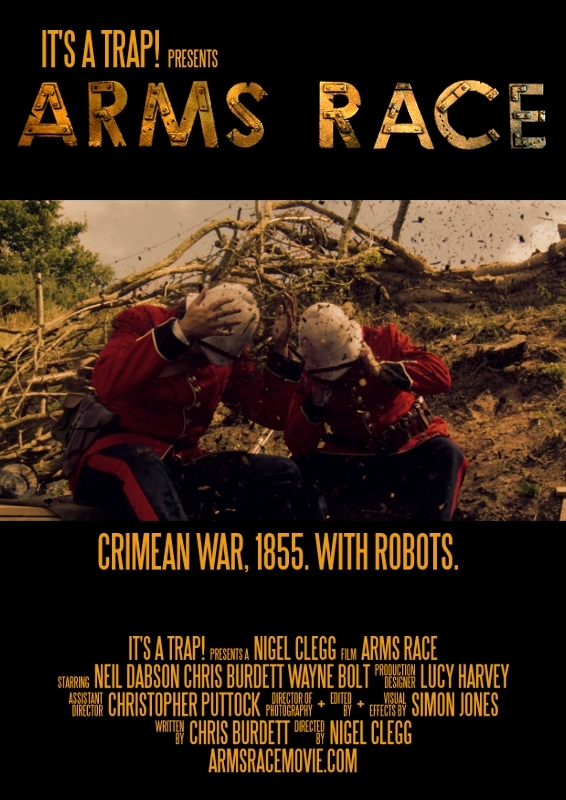 Arms Race is Nigel’s first film as director. A lifelong interest in constructing unlikely contraptions led him to creating numerous props and devices for local short films, with Arms Race being the culmination of his efforts to date. Initially conceived as a test shoot for a couple of new props, the short soon ballooned out into a proper short film, complete with a volunteer team drawn from theatre and commercial filmmaking. Working both as creative lead and lead prop and miniature designer as well as director, Nigel used the film as an opportunity to explore an underused genre and period, working directly with regular It’s A Trap writer Chris Burdett. Brought aboard the project to turn a simple prop test into a genuine story, Chris brought his own experience from penning both series of Jack Steel as well as being lead writer on the forthcoming Ravenskil Chronicles audio drama. Arms Race proved a different challenge altogether, working within the restrictions of the subject matter imposed by the props, although the production design went hand-in-hand with the script, soon requiring additional items, costumes and a convincing war trench to be brought to life. As the story came together the production team began to assemble. We’ll be taking a look at some more of Arms Race’s crew next time. Being a volunteer production the film could not have been made without the support and hard work of all involved. In future blog posts we’ll also be shining a light on the shoot itself as well as the lengthy post-production period.